This is a sponsored conversation written by me on behalf of McCain Foods. The opinions and text are all mine. #JoyintheKitchen. These Disco Fries are a New Jersey diner classic. 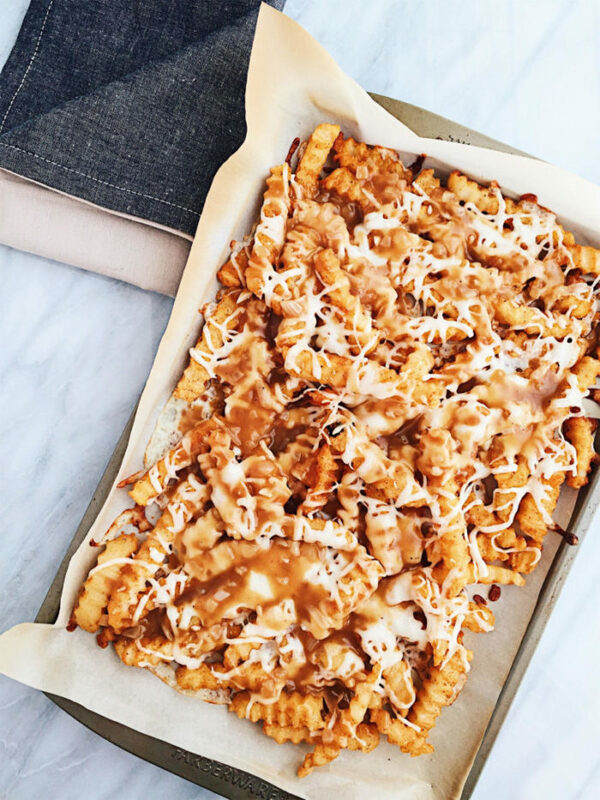 Crunchy crinkle-cut fries get bathed in an easy homemade gravy and gooey mozzarella cheese. What’s one food that instantly reminds you of home? For me, it’s (without a doubt) Disco Fries. If you haven’t spent much time in Jersey, you probably don’t know what Disco Fries are. 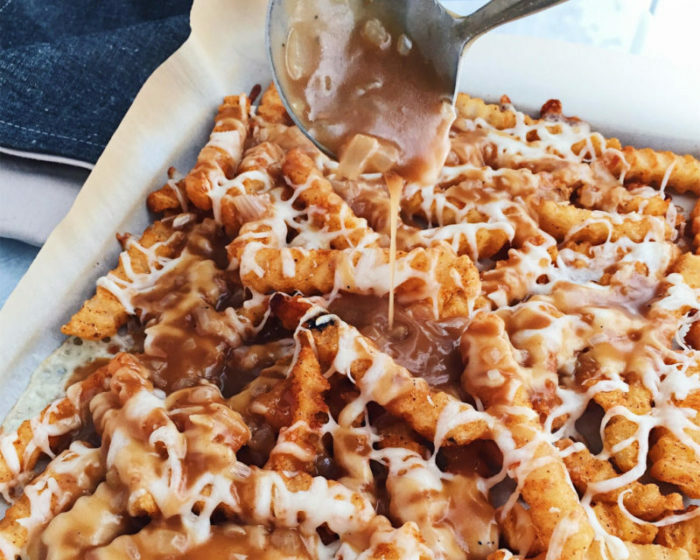 Kind of like the Jersey version of Canada’s Poutine, Disco Fries are simply gravy and cheese fries. The variations, however, differ a little. 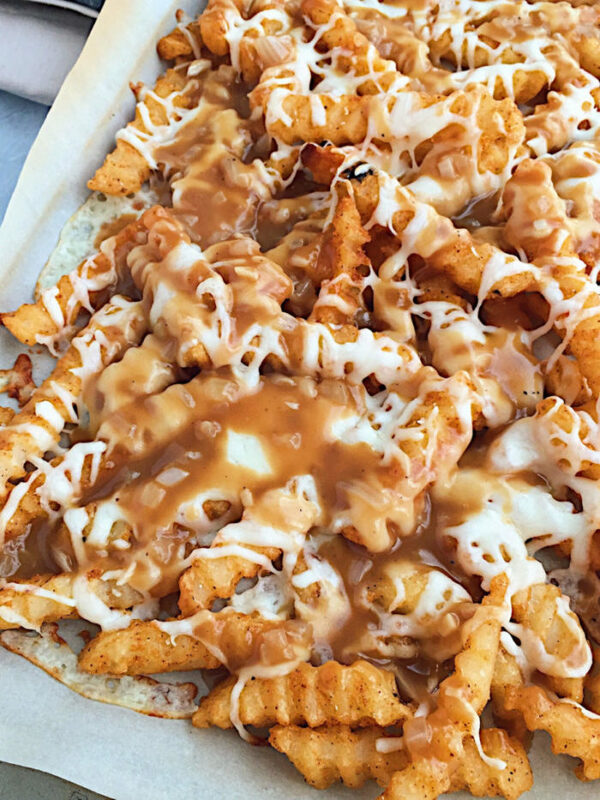 You may find Disco Fries topped with a cheddar cheese sauce, melted Gruyere, a beef gravy, or a chicken gravy. It really depends on where you have them. 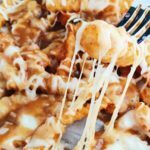 Here, I make my variation of Disco Fries just like I remember having them at my favorite Northern New Jersey diner: with a simple, savory brown gravy and melted mozzarella. 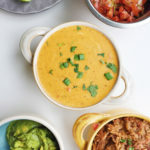 No cheese sauce here. I love how the gooey, stringy mozzarella pulls with every bite. 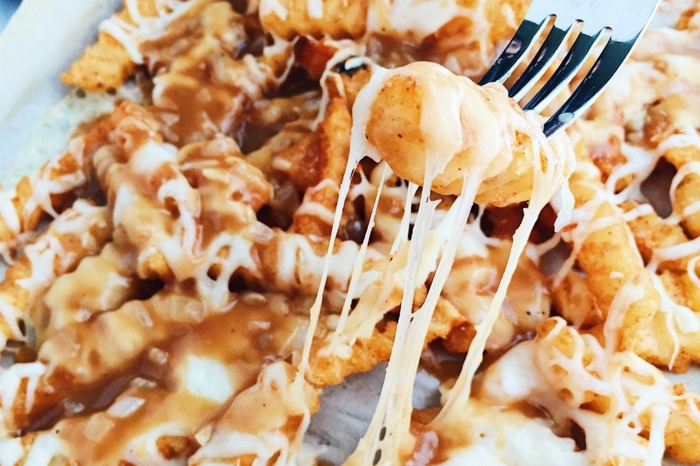 You could use cheddar, but in my opinion, Disco Fries are best with mozzarella. A homemade brown gravy is a must for this recipe, and it comes together quicker than you’d imagine. Just beef stock, butter, flour, Worcestershire, shallot, and garlic transforms into a lovely, rich, and silky gravy to properly crown your crunchy fries. And the crunchiest, most delicious fries to use? McCain’s Seasoned Crinkle Fries. You can purchase them at your local grocery store. Made with no artificial flavors or colors and seasoned with sea salt, these crinkle fries are just perfect for this dish. Those little ridges catch all of that delicious gravy, too! With the Big Game coming up, these Disco Fries would be a great party food to serve. The hearty fries would satisfy even the hungriest football fans. 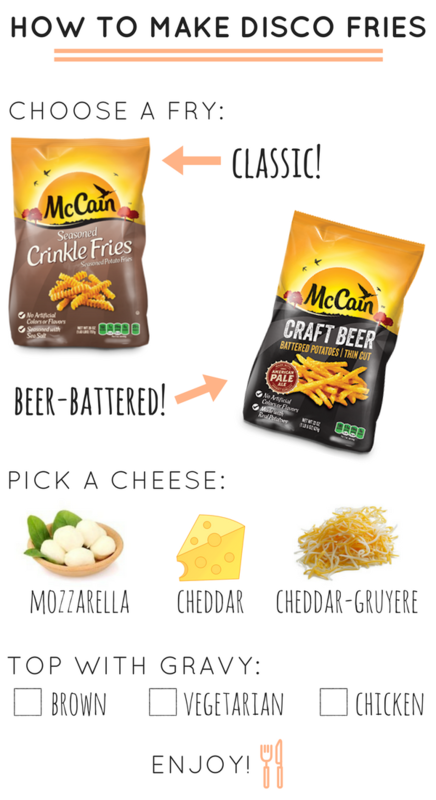 For a fun variation, use McCain’s Craft Beer Battered Fries, made with real American Pale Ale! My Jersey family is big on two things: we’re big fans of football, and we’re big on Disco Fries. 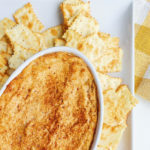 Combine the two at your Big Game viewing party for some gooey, cheesy, tailgate-food fun. Eating a fork-full of these savory fries instantly makes me return to my childhood and young adult years. In high school and throughout college, I had one favorite diner I frequented with my best friend. You would often find us there pretty late at night, since (like all proper NJ diners) it was open 24/7. We always had the same waitress, a kind but no-nonsense redhead named Dawn. And we always ordered a side of Disco Fries. Inevitably, many things have changed since then. But somehow just the presence of these cheesy fries takes me back to simpler times. It’s something I have to get when I go back home to visit. 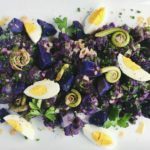 I think this recipe did my favorite comfort food justice, and I hope you can make it and try it for yourself! Thank you to McCain for sponsoring this post! 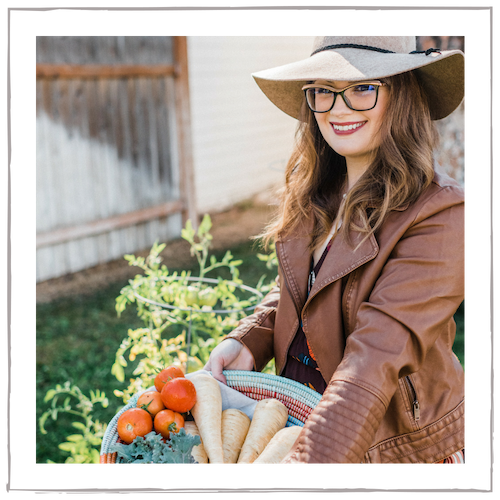 Be sure to check out their website for even more tasty recipes and inspiration! Do you have any tips for making sure your viewing parties are unforgettable? These Disco Fries are a New Jersey diner classic. 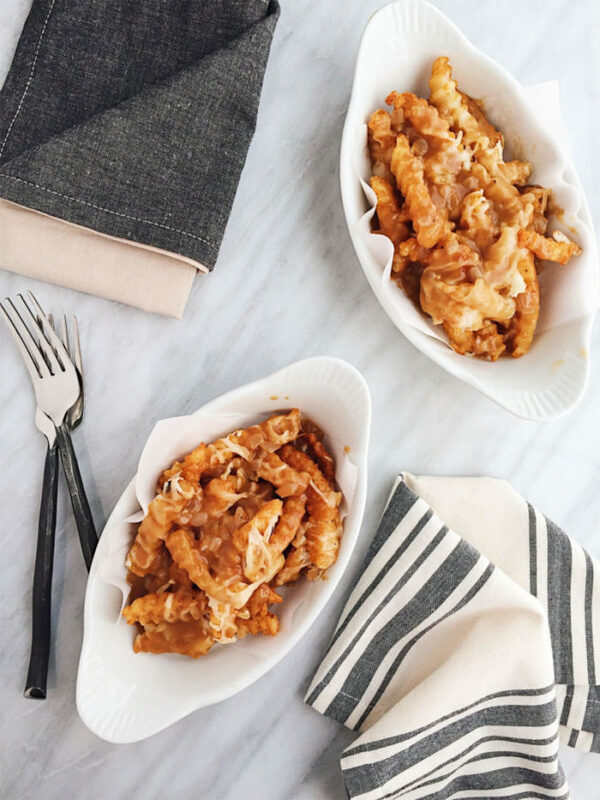 Crunchy crinkle-cut fries get bathed in an easy homemade gravy and gooey mozzarella cheese. Preheat the oven to 425. 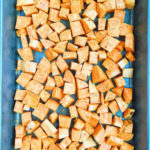 Spread the fries in one single layer on a large parchment-lined baking sheet. Cook the fries until golden and crispy, according to the package directions. 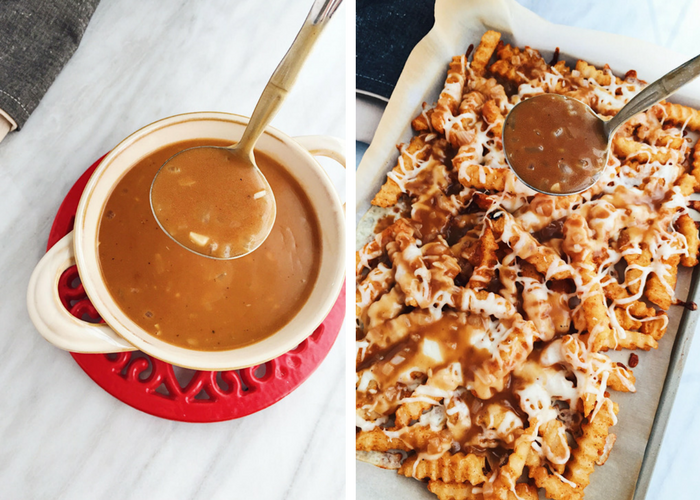 While the fries are cooking, make the gravy. 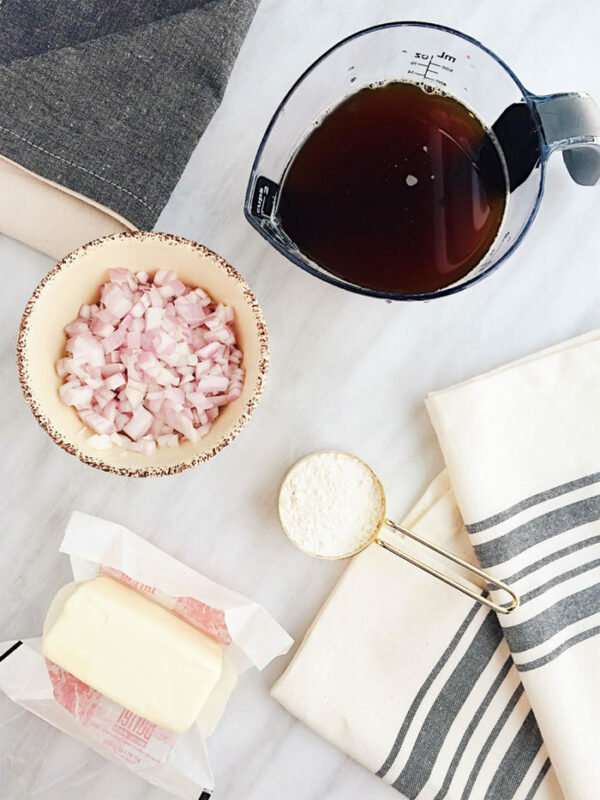 Melt the butter in a sauce pan and add the shallot and garlic. Season with sea salt and pepper. Cook until the shallot and garlic are softened. Sprinkle in the flour and cook, stirring, another 3 minutes. Slowly whisk in the beef stock while constantly stirring to avoid lumps. Add in the Worcestershire and season to taste with salt and pepper (if needed). Bring the gravy to a bubble and simmer 5-7 minutes until thickened. Remove from heat. When the fries are done, remove them from the oven and evenly sprinkle with the shredded mozzarella cheese. Return to the oven 2-3 minutes until the cheese is melted. Pour the warm gravy on top and garnish with fresh parsley. Enjoy! sometime soon. I want to encourage you continue your great writing, have a nice afternoon! First time making disco fries love it!!! I love what you guys are usually up too. Such clever work and exposure! Keep up the very good works guys I’ve you guys to our blogroll. Born, raised and still residing in Dirty Jersey (lol) I can attest to the fact that these Disco Fries are the real deal…fabulous! As a Canadian, poutine is a beloved, guilty pleasure. 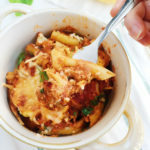 This one looks delicious with mozzarella, and I love the name “disco fries”! Yumm!! My mouth is drooling! Am pinning this for later! I’ve never had anything like this, but that will soon change! Oh my! An an expat Canadian living in the UK this dish is my idea of heaven!!! LOVE the look of those beer battered oven chips too, yum! As a Canadian I know all about POUTINE. 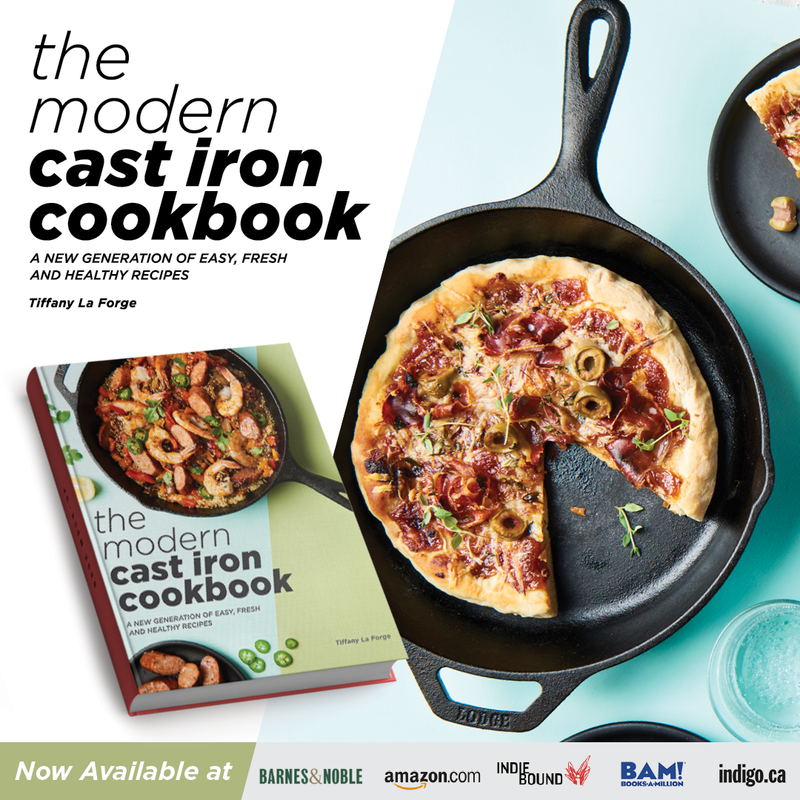 Love seeing all the different recipes people come up with to enjoy our tasty treat. Oooo everything is better with cheese!! Thanks for sharing! haha, definitely agree with that statement, Kathy! Nice!!!! You got me at fries. Had never heard of disco fries. Looks delish. oh MAN oh M A N! i’ve been trying really hard to beat my winter blues by eating healthy and light but this has total saturday night – movie night on the couch – cheat meal vibes. 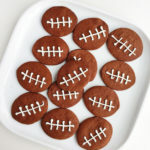 i’m totally going to make these this weekend. I can see why this dish’s name begins with Disco. Makes me want to dance up and down, it sounds so good! I can’t believe I never heard of these growing up in Philly. There are so many “Jersey” things that tend to not ever leave north Jersey, like Taylor Ham and Disco Fries, haha. I would talk to people about those two things in NY and they wouldn’t know what I was saying! Philly has so many goodies though, I miss their pretzels and of course, the cheesesteaks. LOL, sorry Elizabeth! I really, really love poutine. There is a place in Portland that specializes in it and only makes poutine. It’s awesome. I love cheese curds so much! 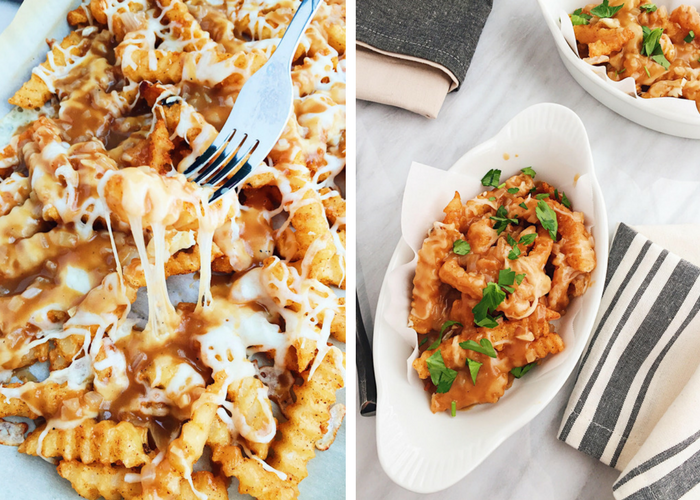 But for me, Disco Fries is more of a comfort food as I’m sure poutine is for you! Can you get curds where you live now? This would be just as delicious with them! I love disco fries!!! These look delicious, and remind me of Jersey hahah.